When you breathe in, the air goes down the windpipe from your Adam's apple down to the back of the middle of your breastbone. 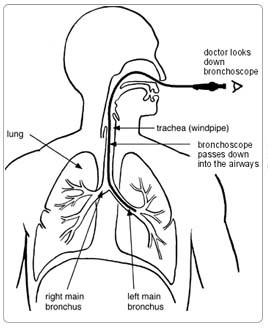 There, the windpipe branches into two smaller tubes which carry the air into each of your two lungs. Each of these smaller tubes is called a bronchus. Inside the left and right lungs, each bronchus branches again and again to get the air into the depths of the lung. Sometimes swellings, lumps, foreign bodies or infection in these air tubes cause problems. The windpipe and the bronchus on each side need to be examined. This operation is called a bronchoscopy. You are likely to have some sedation and a spray to numb the lining of your windpipe. You may have a general anaesthetic and be asleep, if you do not like the idea of sedation. 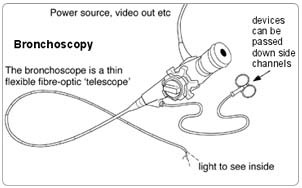 The doctor passes a flexible telescope into your mouth and down into your windpipe. He has a good look inside the windpipe and inside each bronchus. There is plenty of room in your windpipe around this telescope for air to get in and out of your lungs. He may pass very small instruments down the telescope to take tiny snippets of any area that doesn’t look normal. This is called a biopsy.He will send the biopsy to be looked at in the laboratory under a microscope. If it looks as if there is some infection, the surgeon will draw some of the phlegm out of the bronchus through the telescope. He sends the phlegm to the laboratory for tests to identify the bugs causing the infection. The results take a week or so to come back from the laboratory. The wound in the lining of the bronchus heals up very quickly. There is no need for any stitches. There are no cuts in the skin. The examination takes about 20 minutes. You should be fit to go home the same day as your operation. If you leave things as they are, the problems you are having will not go away. You may be losing valuable time if you just wait and see. X-rays and scans do not tell the doctors enough about what is wrong in your case. It is not a good idea for you to start treatment, if the doctors do not know what they are dealing with. Drugs and medicines may well not be the right thing for you in any case. A bronchoscopy is the best way ahead. If you have time before the operation, stop smoking and get your weight down if you are overweight. (See Healthy Living). If you know that you have problems with your blood pressure, your heart, or your lungs, ask your family doctor to check that these are under control. Check you have a relative or friend who can come with you to the hospital and take you home. Sort out any tablets, medicines, inhalers that you are using. Keep them in their original boxes and packets. Bring them to the hospital with you. On the ward, you may be checked for past illnesses and may have special tests to make sure that you are well prepared and that you can have the operation as safely as possible. Please tell the doctors and nurses of any allergies to tablets, medicines or dressings. You will have the operation explained to you and will be asked to fill in an operation consent form. Many hospitals now run special preadmission clinics, where you visit for an hour or two, a few weeks or so before the operation for these checks. If your case is not an emergency and you have a cold in the week before your admission to hospital, please telephone the ward and let the ward sister know. The operation will usually be put off, and you will be given time to get better before being sent for again. You will need to get over the cold before the operation can be done because by having an anaesthetic the cold could turn into a serious infection in the chest. It is quite common for patients to have some coughing attacks after the operation. The phlegm may have some streaks of blood in it. It settles down after an hour or so. You will be given some treatment for sickness if necessary. You may be given oxygen from a face mask for a few hours if you have had any chest problems in the past. You will have a slightly sore throat after the operation where the telescope has been rubbing inside the throat. Painkilling tablets should easily control this discomfort. Ask for more if the pain is not well controlled or if it gets worse. A general anaesthetic may make you slow, clumsy and forgetful for about 24 hours. The nurses will help you with everything you need until you are able to do things for yourself. Do not make important decisions, drive a car, use machinery, or even boil a kettle during this time. You will probably be given an appointment to come back to the outpatient clinic to see the doctor again for a check-up. If any biopsies have been taken, the results should be ready for you at the clinic. The nurses will advise about sick notes, certificates etc. Take two painkilling tablets every six hours to control any sore throat. As with any operation under general anaesthetic (and the same is true for sedation), there is a very small risk of complications related to your heart and lungs. The tests that you will have before the operation will make sure that you can have the operation in the safest possible way and will bring the risk for such complications very close to zero. If you follow the advice given above, you are unlikely to have any problems. There is a small risk that you may cough up some fresh blood when you are at home. If this is just a spot or two it is not important. If you cough up blood for more than an hour or two (and there is a higher chance that this will happen if many biopsies were taken or a foreign body was removed), come back to the ward or contact your GP. If you have had a foreign body removed, sometimes the windpipe, the bronchus, or the lung can be damaged by the foreign body and the damaged area can get infected. You will be told about this if it happens. There is also an extremely small possibility that one of the areas from where the biopsies were taken can get infected. If you get an infection, this nearly always gets settled with antibiotics. Finally, extremely rarely, the telescope or the other instruments that were used during the operation can damage the wind pipe, the bronchus or the lungs (one type of very common and severe damage that can be caused is the creation of a hole/perforation). If this happens you might need another operation to fix the problem.